C++, pronounced “C plus plus” is a programming language that was built off the C language. 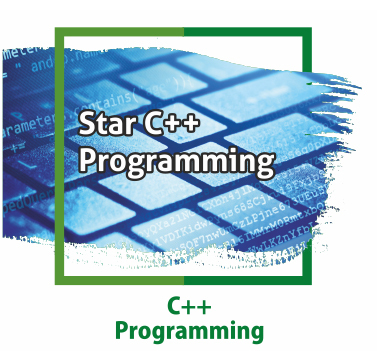 The syntax of C++” is nearly identical to C,C++ programming language with a special focus on the concepts Of OOps and their implementation. it has Object-oriented features, which allow the programmer to create objects within the code. This makes programming easier, more efficient, and some would even say, more fun. Because of the power and flexibility of the language. This course assumes that the Learner is an entrant to the world of programming and that learning C++ programming language is the first step to it. Also, anyone who wants to brush up their C++ programming skills would find this course helpful. Use the characteristics of an object-oriented programming language in a program. Use the basic object-oriented design principles in computer problem solving. Use the basic principles of software engineering in managing complex software project. 1. Exploring Programming Basics and oops Concepts. 3. Working with Tokens, Expressions and Control Structures in C++. 4. Managing Input and Output data. 5. Arranging the Same Data Systematically: Arrays. 6. Classes and Objects in C++. 7. Implementing oops Concepts in C++. 9. Group of Statements: Functions. 10. Implementing Structures and Unions. 11. Pointing to a location: pointers. 12. File Management in C++. 14. Handling Exceptions in C++. 15. Manipulating Strings in C++. 16. Working with Preprocessor Directives. C++ is a newer language, based on C, that adds many more modern programming language features that make it easier to program than C.